So you're finally ready to make the transition into home ownership. You are tired of paying a lot in monthly rent and would rather invest your money into long term wealth. It's a scary and overwhelming thought, right? Well, it doesn't have to be. Buying a home is one of the biggest financial decisions you might ever make in your lifetime but being prepared and researching ahead of time can make the process virtually hassle free. After the sub-prime mortgage crisis, banks and lenders are much more strict about who they lend to and the qualifying factors involved. This means in order to qualify for a home loan you have to have a decent credit score. Usually lenders will use your mid-score to determine credit eligibility. Your mid-score is derived from the median between your three credit bureau scores (equifax, experian, and transunion). Stay up to date and regularly check on your credit report to make sure there is no fraudulent activity and everything is reporting as it should. Besides just affecting your eligibility for the loan, your credit score also determines your interest rate in your mortgage. The better score you have, the better rate you will receive. Maintaining good credit will not just help you qualify for a mortgage but it can save you money in high interest payments. Besides just looking at your income, lenders use debt as a determining factor for loan eligibility. Most loan programs have a Debt-to-income (DTI) ratio you need to meet in order to qualify, meaning the amount of payments you have monthly in debt to the amount of income you make have to meet a certain ratio. The best thing to do is start paying down any high amounts of debt or you can ask your creditor to reduce your card limit which can also reduce your minimum monthly payment amount. The less amount in monthly debt payments you owe the more house you can qualify for. Don't act surprised when your loan officer asks you for personal and financial documentation. Lots of it. Think of it in this aspect: If you were letting someone you didn't know borrower hundreds of thousands of dollars, wouldn't you want all the necessary documentation to show they were going to be able to pay you back? Tax returns, W2's, income statements, pay stubs, and bank statements. 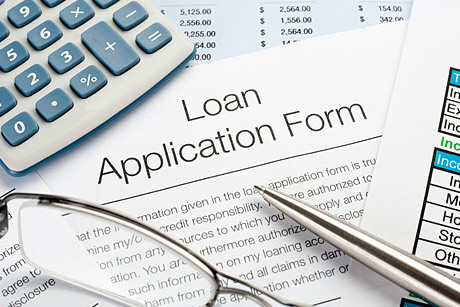 All documentation you should be prepared to hand over to your loan officer. Having these items in advance will also save you time during the loan process so can you get into your dream home faster. Interest rates for home loans are tried to indicators in the overall economy and change daily. Rates can rise and fall sometimes up to a 1/2 of a percent in a day. Once you speak with your loan officer and are comfortable with your interest rate quote, make sure to lock it in as soon as possible. Just because you don't have 10 percent or more to put down on a mortgage doesn't mean you can't buy a home. There are government programs available that allow you to put as little as 3 percent down and in some cases, such as with a VA loan, there is no down payment required whatsoever. These programs are worth looking into and your qualified loan officer should be able to provide you with more information. Click here to find out about no down payment options. Trying to apply for a home loan can seem very intimidating, but if you follow these steps you are bound for a much smoother transaction. For more information on home loans and how to qualify, please visit http://www.ranlife.com. You can also apply for a home loan to see if you qualify right now by clicking here.